WINNER OF THE MARCH GIVEAWAY IS…..
Lindsey, please email me this weekend with your snail mail address so I can get the yarn in the mail to you! This Giveaway is over. The winner has been announced here. This month, you can win TWO BOOKS! 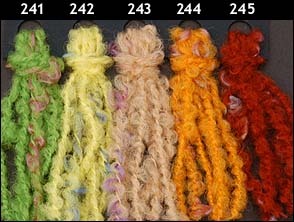 The one pictured above, Making Eyelash Crochet Leis 2 and the first book in the series, Making Eyelash Crochet Leis .